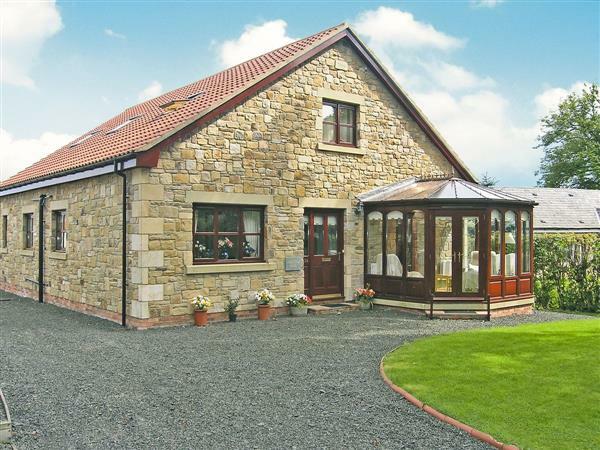 Argentum House in Longhoughton, near Alnwick sleeps 6 people. This detached holiday home lies in the centre of the village, near a bay where walks can be enjoyed. Argentum House sits off the road with a large garden and a conservatory perfect for relaxing after a day out exploring the magnificent Heritage Coastline (Area of Outstanding Natural Beauty). Only 4 miles from the town of Alnwick with its castle and array of eateries and shops. Shop 25 yards, pub and restaurant 500 yards. Ground floor: Living room with French doors. Second living room with double futon (for alternative sleeping only). Dining room with French doors. Kitchen. Conservatory. Utility room. Games room. Shower room with toilet. First floor: 3 bedrooms: 1 double (5ft) with en-suite shower room and toilet, 2 twin. Bathroom with toilet. Gas woodburner in living room included. Gas central heating, gas, electric and bed linen included. Towels at an additional charge. Cot. High-chair. Four Freeview TVs. Videos. DVDs. Gas hob. Electric oven. Washing machine. Fridge/Freezer. Enclosed garden with sitting-out area and furniture. Bar-be-que. Parking (3 cars). Cycle store. Games room with board games and toys. Welcome pack. Pet free of charge. No smoking. Holidays at Argentum House run from Saturday to Saturday. For a better idea of where Argentum House is, you can see Argentum House on the map below. Argentum House is in Northumberland; should you be on the lookout for a special offer, you can find all the special offers in Northumberland. It's always worth checking to see what is on offer at the moment. Do you want to holiday near Argentum House (28472), you can see other cottages within 25 miles of Argentum House; have a look to find your perfect holiday location.